In it, one will find more evidence still (for those who as yet still need it) that the church-of-the-Council is a church of this world indeed; one that has absolutely no interest in the Divine Commission as given by Christ. 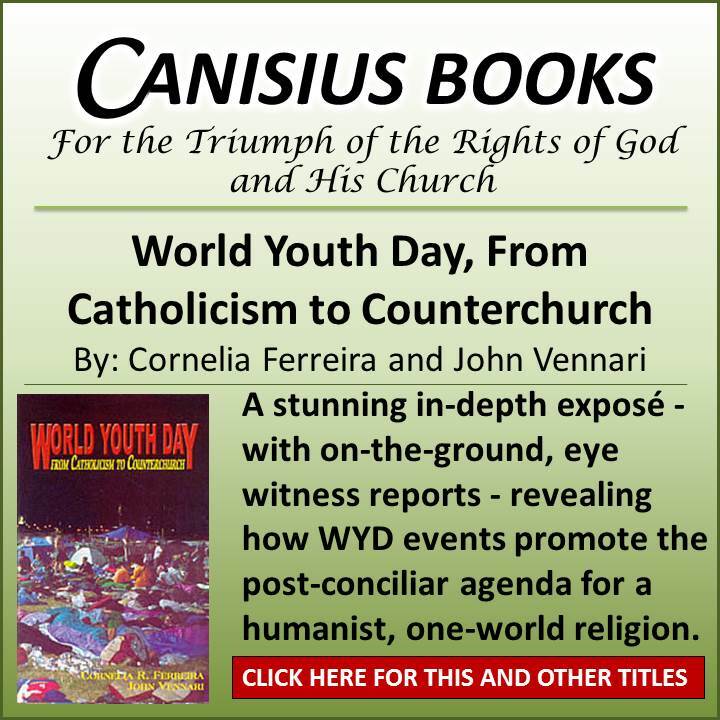 In fact, it is no exaggeration to say that post-conciliar Rome – in particular as it is being led by Francis – is actively opposed to the mission that Christ gave to His Church, and in ways that may just surprise many. …alleviating poverty, feeding the hungry, providing health care, educating multitudes from elementary schools through universities and beyond, promoting the dignity of women and especially their indispensable service as mothers, caring for our water and environment, engaging in peacemaking and peacebuilding, and so many other noble activities. To collaborate with greater energy and effectiveness in … implementing the other pillars of the 2030 Agenda. In this, the Nuncio was referring to the United Nations’ initiative, Transforming our World: The 2030 Agenda for Sustainable Development. So, what are those “other pillars” the implementation of which the Archbishop has pledged to commit the Church’s energy? To find out, we’re going to take a closer look at the 2030 Agenda, but before we do, let’s be very clear about the degree to which Archbishop Auza and Francis, the man for whom he speaks as Nuncio, are aware of its contents. We support the verbatim inclusion of the sustainable development goals and targets as in the Report of the OWG [the Open Working Group charged with drafting the 2030 Agenda] … We would support a strong and focused means of implementation section, recognizing that this section is foundational for the fulfillment of the new agenda. We would strongly encourage the use and coordination of all sources of financing to achieve the SDGs and development in general. NB: The Archbishop, on behalf of Francis, endorsed the draft “verbatim.” Keep this in mind as we go about exploring just what this entails. At one point, Archbishop Auza even provided the U.N. with some expert advice on how best to sell the Sustainable Development Goals to those who as yet remain unmotivated to support the effort. By using brief inspirational or lead sentences, akin to the methods of social media, the political declaration should prepare us for reflection and usher in our interest in the three chapters. First, let’s consider the 2030 Agenda relative to so-called “LGBT” issues. All in all, not the worst news, right? The good news is that there is still sufficiently broad language related to inclusion and sexual and reproductive health and rights that it can encompass LGBT issues. What matters now is how this text gets interpreted and applied going forward. In other words, the 2030 Agenda, at least insofar as the LGBT agenda is concerned, is written in the style of the Council documents! 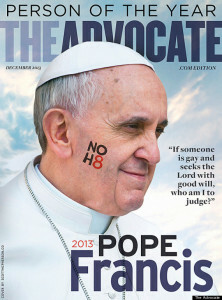 So, how does Bergoglian Rome wish to see the Agenda implemented with regard to so-called LGBT issues? 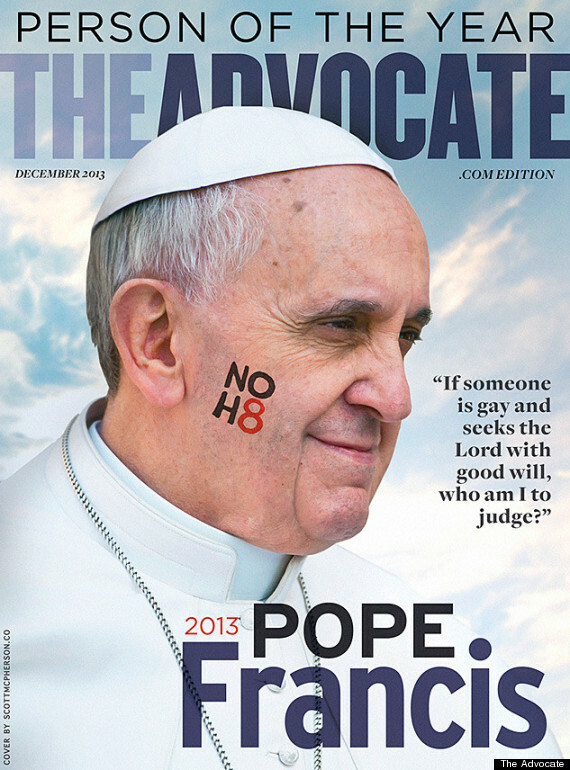 On this point, I suppose we’ll have to wait and see, but given that Francis was the proud recipient of the Advocate “Person of the Year Award” for 2013, and the Vatican has become a veritable gay dude ranch on his watch, I’d say that the handwriting is already on the wall. When it comes to birth control and abortion, however, there is even less reason to expect a good outcome. As the text implies, one can expect that a push will no doubt be underway to pressure individual nations to adopt so-called “family planning and sexual and reproductive health” initiatives as deemed acceptable to the U.N.
NB: Here we find that “sexual and reproductive services” are also anointed as “rights” – a designation that will presumably justify international sanctions against offending nations. Note as well the reference to, and the uncritical acceptance of, the Beijing Platform – a document that impeccably emulates the conciliar model. Note the audacity: The Platform goes so far as to denigrate motherhood even in the context of marriage! And let us not forget – the Beijing Platform is part and parcel of the 2030 Agenda that Archbishop Auza – once again let us be clear – who as Nuncio speaks for Francis, pledged to collaborate with greater energy and effectiveness in implementing. Needless to say, the safety of the unborn child is given no treatment whatsoever. Before commenting on the MDG, one may have already made note of the fact that it is necessary to connect any number of dots in order to obtain a complete understanding of the 2030 Agenda. This is not because the U.N. is sloppy and undisciplined; on the contrary. The document is deceptive by design – a hallmark of the Evil One, the same who has many accomplices, unwitting or otherwise, entrenched in positions of power in Rome; all the way to Domus Sanctae Marthae. On closer look, one will find that the MDG itself boasts of several different “campaigns and initiatives” – one of them being “The Better World Campaign” (BWC). At this point, suffice it to say that the BWC is directly involved in lobbying efforts to ensure international support for the United Nations Population Fund (UNFPA), which provides funding for abortions in countries throughout the world. Much to the dismay of the BWC and Satanic minions everywhere (some of them most certainly in Rome), President Trump has since decided to withdraw U.S. funding from the UNFPA. We could go on connecting the dots all day long, but presumably the point has been made. We would strongly encourage the use and coordination of all sources of financing to achieve the SDGs and development in general. 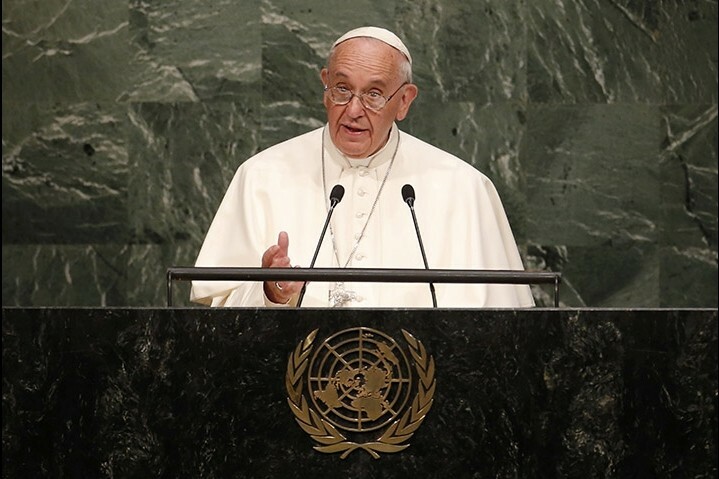 It would appear that in addition to endorsing “verbatim” what ended up becoming the language of the 2030 Agenda, the Archbishop, on behalf of His Humbleness, Francis, also made a financial commitment on the part of the Holy See for the purpose of implementing the U.N.’s Sustainable Development Goals. Keep that in mind if and when your parish asks for donations to Peter’s Pence; something that took place in most parishes in the the U.S. in early July. In keeping with my last post, Naming names, readers may be interested in knowing that the Remnant ran an article in June 2016 raising a red flag with regard to Peter’s Pence. 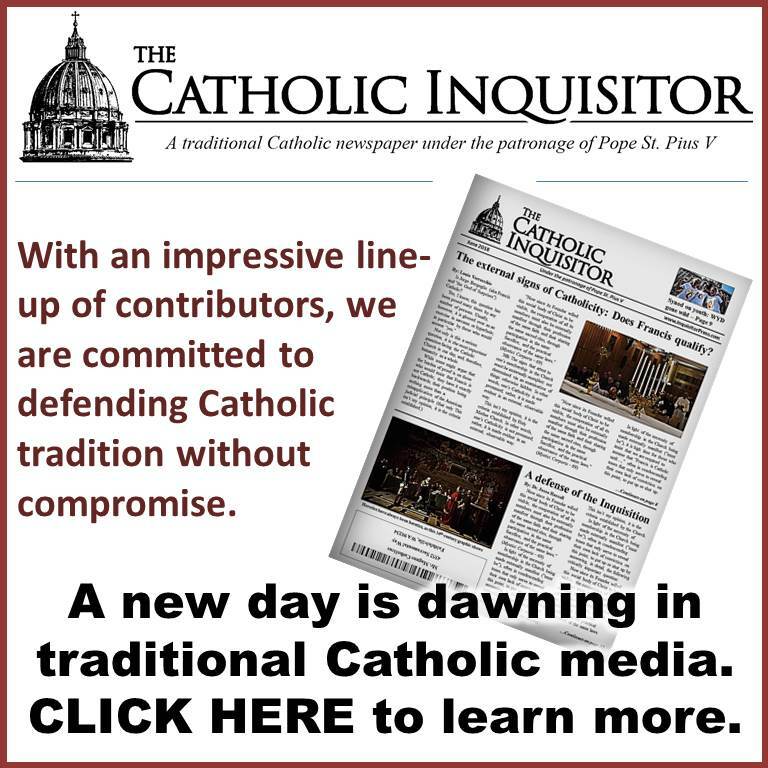 Why give a donation of which 95% will NOT go to the propagation of Tradition or the true Mass, when you could give one to Traditional priests like the SSPX, of which 100% would go to the propagation of Tradition and the true Mass? Speaking of the SSPX, I am wondering whether or not the Society itself makes a contribution to Peter’s Pence or otherwise sends funds directly to the Holy See. To find out, I just sent an inquiry to the U.S. District House. In the meantime, I discovered that the SSPX published a positive article on Peter’s Pence back in March. What this indicates, I do not know, but I hope to discover that the Society does not forward even a nickel collected from its faithful directly to the Holy See. I will keep you posted as to their reply. I am also unaware to what extent dioceses are required to send money to the Holy See. I reviewed the latest available financial statement from the Archdiocese of Baltimore (my diocese) and no such entry was obvious. In any case, one must likewise beware when solicited by any Catholic group that routinely sends money to the Holy See; e.g., the Knights of Columbus, who presented Francis with a check for $1.6 million in February 2017. The Evil One is a master of deception indeed. If you can help it, don’t let him deceive you or your loved ones into funding the nefarious agenda outlined in this post. Please, just stata zitt’ already! 23. “If someone who has the riches of this world sees his brother in need and closes his heart to him, how does the love of God abide in him?.” It is well known how strong were the words used by the Fathers of the Church to describe the proper attitude of persons who possess anything towards persons in need. To quote Saint Ambrose: “You are not making a gift of your possessions to the poor person. You are handing over to him what is his. For what has been given in common for the use of all, you have arrogated to yourself. The world is given to all, and not only to the rich”. That is, private property does not constitute for anyone an absolute and unconditioned right. No one is justified in keeping for his exclusive use what he does not need, when others lack necessities. In a word, “according to the traditional doctrine as found in the Fathers of the Church and the great theologians, the right to property must never be exercised to the detriment of the common good”. If there should arise a conflict “between acquired private rights and primary community exigencies”, it is the responsibility of public authorities “to look for a solution, with the active participation of individuals and social groups”. 2. What must be aimed at is complete humanism. And what is that if not the fully-rounded development of the whole man and of all men? A humanism closed in on itself, and not open to the values of the spirit and to God Who is their source, could achieve apparent success. True, man can organize the world apart from God, but “without God man can organize it in the end only to man’s detriment. An isolated humanism is an inhuman humanism”. There is no true humanism but that which is open to the Absolute and is conscious of a vocation which gives human life its true meaning. Far from being the ultimate measure of all things, man can only realize himself by reaching beyond himself. 49. We must repeat once more that the superfluous wealth of rich countries should be placed at the service of poor nations. The rule which up to now held good for the benefit of those nearest to us, must today be applied to all the needy of this world. Besides, the rich will be the first to benefit as a result. Otherwise their continued greed will certainly call down upon them the judgment of God and the wrath of the poor, with consequences no one can foretell. If today’s flourishing civilizations remain selfishly wrapped up in themselves, they could easily place their highest values in jeopardy, sacrificing their will to be great to the desire to possess more. To them we could apply also the parable of the rich man whose fields yielded an abundant harvest and who did not know where to store his harvest: “God said to him: ‘Fool, this night do they demand your soul of you’”. While shaping the world it sets a higher value on man. 51. But it is necessary to go still further. At Bombay We called for the establishment of a great World Fund, to be made up of part of the money spent on arms, to relieve the most destitute of this world. 76. Excessive economic, social and cultural inequalities among peoples arouse tensions and conflicts, and are a danger to peace. 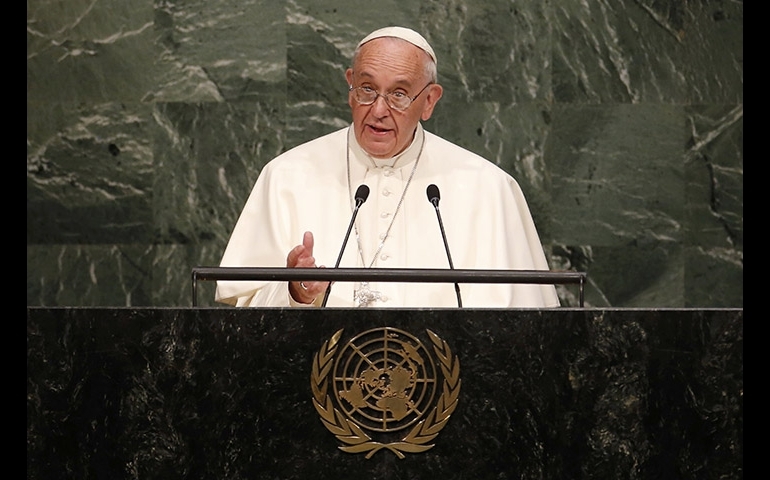 As We said to the Fathers of the Council when We returned from Our journey of peace to the United Nations: “The condition of the peoples in process of development ought to be the object of our consideration; or better: our charity for the poor in the world — and there are multitudes of them — must become more considerate, more active, more generous”. To wage war on misery and to struggle against injustice is to promote, along with improved conditions, the human and spiritual progress of all men, and therefore the common good of humanity. Peace cannot be limited to a mere absence of war, the result of an ever precarious balance of forces. No, peace is something that is built up day after day, in the pursuit of an order intended by God, which implies a more perfect form of justice among men. 85. If it is true that the world is in trouble because of the lack of thinking, then We call upon men of reflection and of learning, Catholics, Christians, those who hold God in honor, who thirst for an absolute, for justice and for truth: We call upon all men of good will. 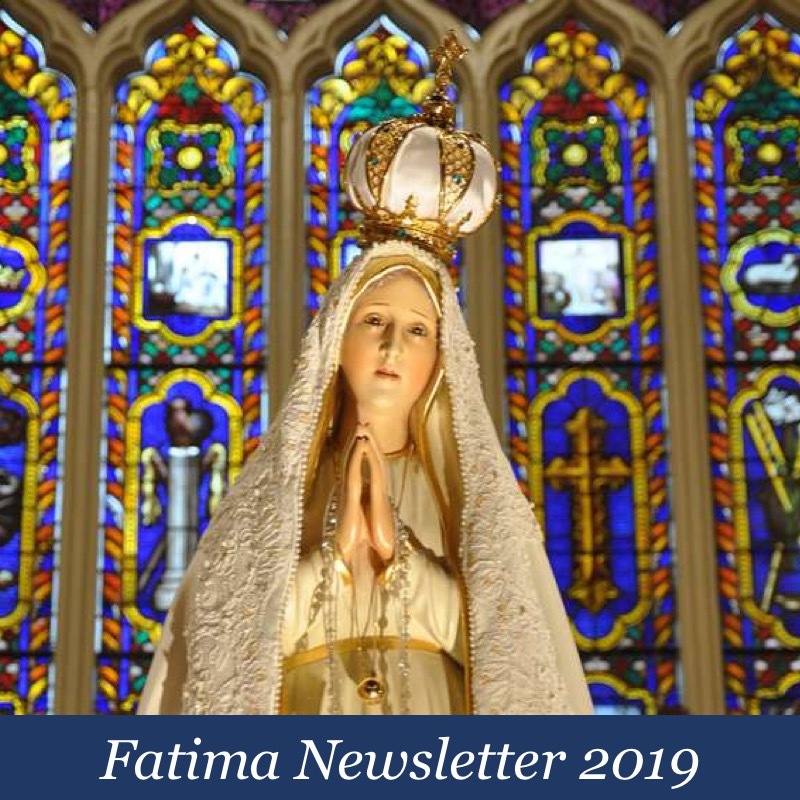 Following Christ, We make bold to ask you earnestly: ” seek and you shall find”, open the paths which lead to mutual assistance among peoples, to a deepening of human knowledge, to an enlargement of heart, to a more brotherly way of living within a truly universal human society. The postconciliar Modernist V2 “church” could not possibly know the true mission of the Holy, Roman Catholic Church because it is NOT Catholic. May I recommend reading the life of Mother Frances Cabrini who, in her 67 years on earth, established 67 institutions for help and relief of the poor and downtrodden, including schools, hospitals, orphanages and shelters of all forms. The True Catholic Church did not need Vatican II to become a source of charity and comfort for those in need. She knew this was her mission while saving souls through the Holy Mass and Sacraments. The pseudo-church, under the guise of charity, is now a pawn for the ultra-powerful who would use the influence of the Vatican for their own selfish, evil and corrupt ends. Great article, Louie. 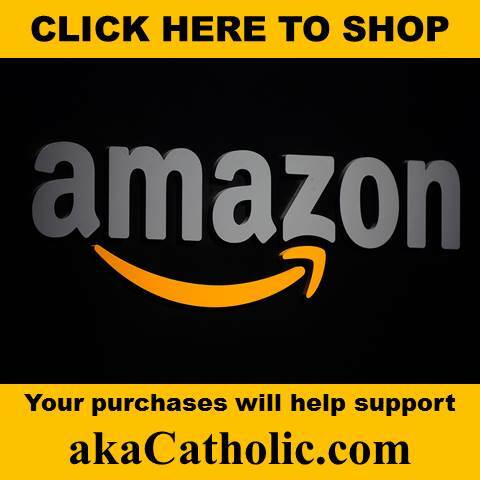 Please alert aka Catholics regarding contributions to the SSPX. Our Lady of the Rosary formally requested the Consecration of Russia six days after the Lateran Treaty was ratified. Pius XI took money that he was given in compensation for the loss of the Papal States and founded the IOR, aka The Vatican Bank. Bernardino Nogara was the first administrator of the IOR. Nogara took the job on condition that he not be restricted by any ethical considerations. That is how financial corruption on a massive scale was introduced into the fabric of the Church. Is it any wonder that Pius XI ignored Our Lady’s request for the Consecration of Russia? Do you still wonder why Our Lady predicted that a worse war, aka WWII, would begin during the reign of Pius XI? Our Lady still gave Pius XI the chance to do the right thing. Pius XI had a free will and there was still a chance that he would do the right thing. Long story short, the Vatican is rolling in cash. They could care less about Peter’s Pence. I hereby declare pius xi anti pope! He may have said some good things but it is not Catholic to pick and choose. He must be rejected entirely for promoting usury which is against the Gospel (Luke 6:35). Since the love of money is the root of all evil (Tim 6:10) nothing has done more damage to Holy Mother Mother Church. He is not Catholic and a non catholic cannot be head of the Catholic Church, so help me God. The fuel cost alone could have bought 22,634 hamburger Happy Meals for hungry children in New York. What a squandered opportunity to give to the poor!!! For this effort I was declared a protestant, a hater of Catholicism, arrogant, prideful, more Catholic than the Pope, a despiser of the poor, self-righteous, and like a thief akin to Judas. And I though saving a quarter mill was a good idea! silly me! Modern Papal travel is a joke. Popes can do almost everything that they need to do right from St Peter’s. All of these trips are surely a waste of money (why anyone would give a penny to the vatican 2 church to begin with is another story). If you are a true Catholic in 2017 and havent yet been accused of believing that you are “more Catholic than the Pope” then you are doing something wrong ;). No wonder Al ‘giant carbon footprint’ Gore says Bergoglio makes him want to join the Catholic Church. The motto of these power-hungry elites: Do as I say – not as I do. Thanks for the info, mpoulin. Now I know not to waste any time at Crisis Magazine. These people are simply not members of the Catholic Church. Not because I “declare” it to be so. I’m doing no such thing. Neither does the sun rise each morning because I declare it. It is just a statement of fact. It is by the externals that we can know who is and who is not a member of the visible Church. Submit to non-Catholics at your own risk. Certainly God has not commanded that we do so. We need you to travel back in time and save the Church from all the other bad Popes. Plenty of bad popes, but no heretic can be Pope. Only Catholics can be Pope. Francis is not a Catholic. Therefore Francis cannot be Pope. The Church guarantees that a Pope will not teach heresy, Ex Cathedra. The Church guarantees that she will be visible to all at all times. The Church guarantees that Apostolic Succession will continue to the end of time.